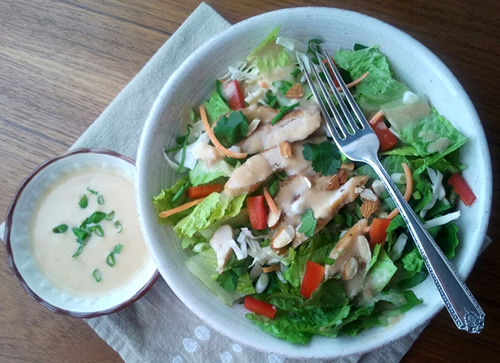 Ginger-peanut dressing | Ginger-peanut dressing – oh, that's tasty! Just toss all this together and serve immediately, or cover and chill till you’re ready to serve. Just before serving, drizzle on the dressing. This recipe makes enough for about four servings. Combine all ingredients except for canola in a blender and process till smooth. With the blender running, drizzle in the canola oil. Best if chilled for a couple hours before serving.